This is a brief exposé about one of the most important poets in Latin American history. 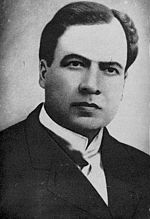 Félix Rubén García Sarmiento (January 18, 1867 – February 6, 1916), known as Rubén Darío, was a Nicaraguan poet who initiated the Spanish-American literary movement known as modernismo (modernism) that flourished at the end of the 19th century. Darío has had a great and lasting influence on 20th-century Spanish literature and journalism. He has been praised as the “Prince of CastilianLetters” and undisputed father of the modernismo literary movement.